Why bother with a teapot if you’re just going to be making one cup of tea? Using a tea infuser mug is an all-in-one solution that makes brewing loose leaf tea easy and fast. And when you’re done, you only have one thing to clean. One tea infuser mug is a better investment than a dozen regular mugs. 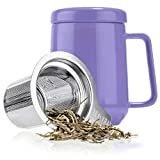 If you don’t care about the details, I found that the best all around tea infuser mug was the Live Infused Tea Infuser Mug. Our runner up was the Herringbone Double-Walled Tea Cup and is a great option if you want to bring your infuser mug on the go. Lastly, if you want a simple infuser mug with a handle, you can’t go wrong with the Sweese Porcelain Tea Mug. If you would like to see all the mugs I reviewed, check out the product table down below. This tea infuser mug is both functional and incredibly affordable for what you get. It is listed on Amazon for $14.95 at the time of writing. I would have liked to see an option for an attachable drink lid to make this a true travel mug, but this limitation doesn’t outweigh it’s benefits. This is a fantastic tea infuser mug and is great for everyday use. It can also make a wonderful gift for a friend or family member who loves tea. Another great option for a tea infuser mug is the Herringbone Double-Walled Tea Cup. It has a simple but elegant design and can hold plenty of tea. The mug comes with an attachable silicone lid that won’t fall off easily and can prevent spills. It is a bit heavy and weighs nearly 2 pounds. If the weight doesn’t bother you, this mug is a great option for a tea infuser mug that can be used on the go. This tea infuser mug by Live Infused is an amazingly functional piece. The mug itself consists of a ceramic body with a bumpy silicone grip. The grip allows for easy holding and protects your hand from the heat of the drink. The mug holds a large amount of liquid without being excessively large or heavy. Besides the mug, there is a food grade silicone lid and a large stainless steel infuser. The lid rests on top and will keep your drink hot if left on. The infuser is similar to many other stainless steel infusers. It has little holes that let plenty of water in but are small enough to keep all but the finest tea particles in. This infuser is also very deep and allows plenty of room for your leaves to unfurl and expand as they brew. Once you are done brewing, the infuser can be placed directly onto the upturned silicone lid. This prevents your infuser leaking all over your table or counter and creating a mess. And when you are finished drinking tea, each part of this tea infuser mug is dishwasher safe after a quick rinse. The pieces are also easy enough to hand wash if necessary. The biggest downside of this mug is that the lid fits on loosely. This is the case for most of the tea infuser mugs in this list. These mugs really aren’t meant to be used as travel mugs. 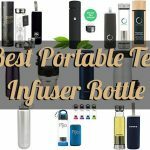 If you are looking for a portable tea infuser bottle, check out our other guide here. If you do decide to use it as a travel mug, it is the perfect size to fit in most car cup holders. This tea infuser mug is both functional and incredibly affordable for what you get. It is listed on Amazon for $14.95 at the time of writing. I decided not to even have a budget option because this would have been the budget pick as well. I would have liked to see an option for an attachable drink lid to make this a true travel mug, but this limitation doesn’t outweigh it’s benefits. This is a fantastic tea infuser mug and is great for everyday use. It can also make a wonderful gift for a friend or family member who loves tea. Two lids. One is ceramic, can hold mug & infuser. One is food grade silicone and can be drunk from; attaches to top. 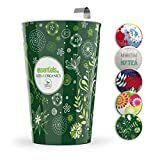 None, but there is same mug as separate product with floral pattern. Click here to see that design. Another great option for a tea infuser mug is the Herringbone Double-Walled Tea Cup. It has a simple but elegant design and can hold plenty of tea. The mug is made of a double-walled ceramic design that keeps your drink insulated and your hand cool. There are also two lids that come with this mug. One is ceramic and rests on the top to keep your tea hot. The other is a food grade silicone lid that attaches to the top and acts like a coffee lid. This silicone lid is handy if you plan to use your tea infuser mug on the go. The stainless steel infuser is large enough to hold plenty of tea and gives it enough space to expand and circulate. When you are done infusing your tea, you can use the upturned ceramic lid to hold the infuser and prevent it from dripping. The disadvantage with this mug is its weight. At nearly 2 pounds, it is one of the heaviest mugs on our list. If the weight doesn’t bother you, this mug is a great option for a tea infuser mug that can be used on the go. It is the right shape and size to fit most car cup holders. Also, the attachable silicone lid won’t fall off easily and can prevent spills. This bottle actually comes in two designs, but they are listed as separate products. You can view that other design here. Tea infuser mugs are also generally made of ceramic. Most of them have lids that rest on top. These lids are not secure and can slip off if you’re not careful. A number of the mugs are more traditional and have a ceramic handle. Several mugs get around this by having a double-walled ceramic design with a gap of air in between. This keeps the tea hotter longer and allows you to hold the mug without burning yourself. Portable tea infuser bottles are made for travel. They fit perfectly in most car cup holders, keep your tea hot for hours, and have screw on lids to prevent leaks and spills. These traits make them great on the road but would be annoying if you only drink tea at home. Buy a tea infuser mug if you drink your tea at home and don’t bring it out often. They are simpler to use and easier to clean. Check out the comparison table to see each mug I reviewed. Tea infuser bottles are a great option for anyone who wants to bring their tea with them on the go. This could mean on your daily commute to the office, while you travel around, or while camping or hiking. I wrote an in-depth guide to help you pick the best choice for your needs. Check that out here. There is one exception to this. If you want a ceramic mug that can be used on the go, there are several options covered in this guide. Ceramic travel mugs generally have a silicone lid that attaches to the top. Our recommendation for a ceramic travel mug is the Herringbone Double-Walled Tea Cup. Some other choices include the Steep & Strain Ceramic Tea Mug or the BZY1 Glass Tea Cup with a screw on lid. Heat some water. You can use a kettle if you have one, or you can microwave water directly in the mug for 1-2 minutes. Do not put the metal infuser in the microwave. Measure out how much loose leaf tea you want in your infuser. Generally 1-2 tsp or 3-6 grams per cup depending on its size. Steep the infuser for the correct amount of time depending on your tea. You can gently churn the infuser to help water circulate. Remove the infuser and place it on the upturned lid. Most of them act as drip trays. If you want to keep the lid on the mug to keep your tea hot, place the infuser into the sink. 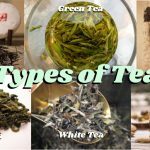 If you are unsure about how long to steep your specific kind of tea, check out our brewing guide: How To Brew Tea in 5 Easy Steps. Most tea infuser mugs are dishwasher safe, but hand washing can be more thorough and may help your mug last longer. I have included quick instructions for both. Give your infuser, mug and lid a quick rinse to wash away leaves and stains. Rinse all parts with hot water. Lightly scrub any hard to clean parts on the strainer or mug. Over time, your mug may also accumulate tea stains. Luckily, there are a few easy tricks to make your mug look brand new. Scrub with a baking soda & water paste. Tipnut has a more in-depth guide on removing coffee and tea stains if you are so inclined. To scout out the best option for a tea infuser mug, I did what you would do if you had the time and this guide wasn’t around. First, I took a look at other buyers guides and explored their options and opinions. Then, I checked Amazon and Google to find existing popular options and a few less popular ones as well. With this list, I checked out the product details to get a rough overview of each mug. Finally, I sifted through user reviews to see what other customers had to say. With all this info in mind I compared the pros and cons of each option and gave my rating and review. Since all the hard work is done, all you have to do is read the overviews and make your own decision on which mug best suits your needs. 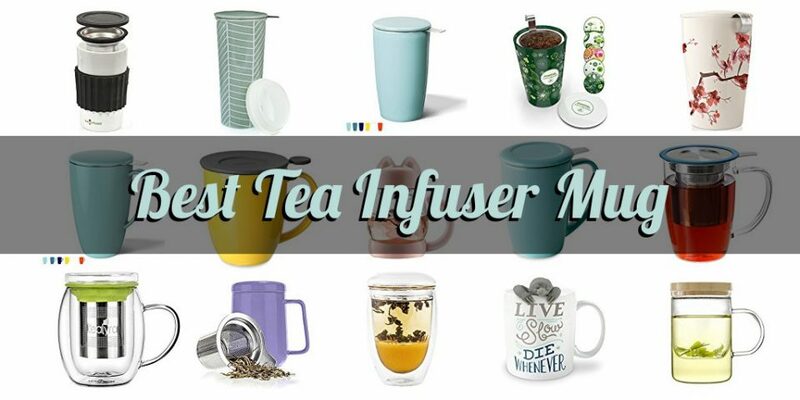 Check out our comparison table to see each tea infuser mug I reviewed. 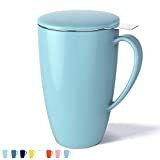 The Sweese Double-Walled Porcelain Tea Mug is a high quality insulated tea mug. A layer of air sits in between two layers of porcelain, ensuring that your tea stays hot much longer than with a standard mug. Your tea will stay hot even longer if you keep the porcelain lid on the top. This mug also features a large liquid capacity in addition to its insulating properties. The infuser is made of a holed stainless steel. It is large and allows you to brew as much tea as you want. The large brewing space also allows plenty of room for water to circulate and expand your tea leaves. While the holes may not be as small as a fine mesh, it is small enough to keep most tea particles out. Plus, when you are done infusing, you can remove the metal infuser and place it in the lid to prevent leaking. This mug is a bit heavy because it is made of ceramic and has a double-walled design. In addition, porcelain is fragile and even a small drop onto the counter is enough to crack or shatter the mug. The lid can slide around when the infuser isn’t in the cup, so it can be a bit of a hazard on it’s own. Condensation can form around the lid making it even more slippery. Since there isn’t a handle on the lid, you have to be extra careful when removing it. 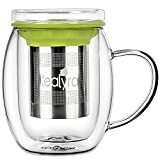 It’s insulating capacity paired with the large mug size and large infuser make this mug a great choice. If you have a tea lover in your life, this mug can make an excellent housewarming, wedding, or holiday gift. There are a number of color customization options so you can pick the color best suited for the occasion. Two lids. One is ceramic, can hold infuser. The other is a silicone lid you can drink from; attaches to top. This little tea infuser mug is essentially a ceramic travel mug. The mug is made of double-walled ceramic to keep your drink hot for longer and protect your hands from the heat. It comes with two separate lids depending on whether you are on the go, or enjoying a cup at home. 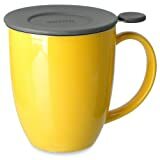 One lid is ceramic and similar to most of the other mugs on this list. The second lid is made of a food grade silicone and can attach to the top of the mug. 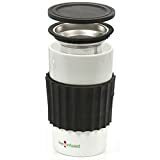 It has a small drink hole at the top similar to a coffee cup, and lets you bring the mug with you without worrying about a ceramic lid. The last piece that comes with this mug set is the metal mesh strainer. This strainer is also unique compared to our other travel mugs. I like that they used a mesh, but the brewing area for tea is tiny. I wish they had decided to use a deep basket mesh for the strainer. Another downside of this mug is how small it is. They likely did this to prevent the mug from being too heavy, but it holds much less liquid than most tea infuser mugs. It makes up for its size somewhat by being affordable. But a better all around option for a ceramic travel mug is the Herringbone Double-Walled Tea Cup. If you are in love with this mug and don’t mind the small capacity, it is not a bad choice by any means. It comes in multiple custom patterns that you can pick from to fully customize your mug. It can make a fun gift for a friend or a great everyday travel mug for yourself. The Tea Forte KATI mug is both beautiful and functional. It comes with a painted cherry blossom design on the outside that reminds me of cool summer days. The base of the mug is made of double-walled ceramic. This insulated design keeps your tea hot much longer than a traditional ceramic mug. It won’t retain heat for hours like a vacuum insulated stainless steel mug, but it does a good job for a mug. Besides the body, this infuser mug comes with a slightly rounded ceramic lid and a cone-shaped stainless steel infuser. The lid isn’t super tight, but rests on the top snug enough. As you brew tea, the holes in the infuser are small enough to keep most tea in. When you are done brewing you can remove the infuser and place it on the lid upside down. This will prevent tea dripping all over your table or counter. This mug is a bit more on the fragile side. All ceramic is susceptible to cracking, but the double-walled design requires a thinner ceramic. Treat this mug with care to avoid cracking and chipping. The beauty and elegance of this mug make it an excellent housewarming, wedding, or holiday gift. There are a number of other designs available in the Tea Forte KATI series available as separate products. 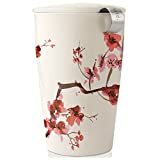 Take a look at the green or brown flower mugs if the cherry blossom design isn’t your favorite. The Immortalitea Tea Infuser Cup is a beautiful all-glass mug. Every part of this infuser is glass, which means there’s no chance of having toxic or foul tasting chemicals leech into your tea. The other benefit of an all glass design is that you can actually watch your tea leaves expand and unfurl as they infuse. This mug comes with a thick glass lid and glass infuser. There are several thin slits in the bottom of the infuser that allow water to pass through. However, this slit design isn’t as efficient as a metal mesh or fine-holed infuser. The slits occasionally get clogged by leaves and they are large enough to let some small leaves pass through the bottom. The upturned glass lid can hold your infuser once the tea is done brewing. While glass is beautiful, it can crack or shatter if dropped. This mug is made of thin glass so even a small fall onto a hard surface may cause damage. If you understand the risks, the Immortalitea Tea Infuser Cup can be a great infuser mug for special occasions. This porcelain tea mug by Sweese can hold quite a bit of liquid. The mug and infuser are sturdy and durable for being ceramic. There are three parts total: the porcelain mug with a handle, a porcelain lid, and a large infuser. The infuser body is quite large. It can hold a large amount of tea leaves and gives them plenty of room to expand, even if you don’t fill it up to the top with water. There are fine holes around the body of the infuser that are small enough not to let tea particles through. And once you are done brewing your tea, you can remove the infuser and place it in the lid until you are ready to clean it or use it for a second infusion. While this mug may have a durable construction, it is still made of porcelain. Both the mug and lid can crack easily if dropped. When the infuser is not sitting in the mug, the lid is a bit loose fitting and can slide off the top of the mug. Proper care must be taken when using this mug to keep it in one piece. The Sweese porcelain tea mug is a good option both for everyday use or as a gift for a friend or family member. There are a large number of customization options if you don’t like the light blue color, including a number of cool patterns. The ForLife Uni Brew-in-Mug is a large and durable ceramic drink mug. It comes with a BPA free plastic lid instead of ceramic. This is nice because if the lid slips off and falls to the floor it won’t break like a ceramic lid would. This mug also comes with a stainless steel infuser with small holes drilled around it. The infuser lets water circulate through your tea while keeping the majority of tea particles in. When you are done brewing, the lid can act as a drip tray for the infuser. And once you are ready to clean everything, all parts can be thrown into the dishwasher after a quick rinse. 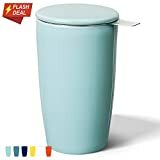 If you are looking for a large ceramic mug with an unbreakable lid, look no further. There are even a number of vibrant colors to choose for. The one downside of this mug is the price tag. 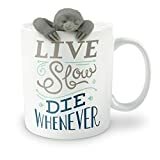 At the time of writing, this mug was listed on Amazon at $27.50, making it one of the most expensive options on this list. Strainer instead of infuser. Stainless steel with small holes. This mug is easily the cutest tea infuser mug I found. The whole mug is in the shape of a cat. The body of the mug is made of heat-resistant glass with BPA-free plastic base and handle which form the body and tail of a cat. The lid is the cat’s head and is also made of a BPA-free plastic. And despite being able to hold quite a bit of liquid, it is one of the lightest mugs I reviewed. The way each piece fits together is closer to a portable glass tea infuser bottle than a mug. Instead of resting on top, the lid screws on. This can be great if you want to bring your mug on the go. 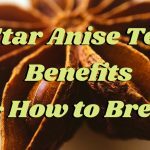 In addition, leaves are brewed directly inside the mug and a strainer is used instead of an infuser which strains your tea as you drink. Once you are done all parts can be easily hand washed or thrown into the dishwasher for easy cleaning. This tea infuser mug makes a fun and cute gift for a close friend. You can pick from several color options to make this an amazing choice as a housewarming, wedding, or holiday gift. This Curve Tall tea infuser mug by ForLife is high quality, large, and durable. The mug is ceramic and features a long, looping handle, making it easy to hold. 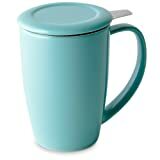 The exterior of the mug has a high quality glossy finish and there are a number of vibrant color options. The mug comes with a large stainless steel infuser. There is plenty of room in the infuser for your tea to brew and circulate. Once you are done brewing your tea, you can place the infuser on the lid. The lid functions as both a drip tray and an insulating cover to keep your tea warm. However, the lid can slide around a bit when the infuser isn’t in the mug. This mug is also rather durable, despite being made of ceramic. One customer even dropped their mug and had it survive the fall. It is a great choice for a birthday or holiday gift, or as an everyday mug for yourself. This glass tea infuser mug is elegant and beautiful. The body is made of a thin glass and has a big glass handle. This glass design allows you to watch your tea infuse. Both the lid and infuser are made of stainless steel. The lid has a silicone ring around it which helps it grip to the cup or infuser. There are also several different color silicone bands to choose from so you can personalize your mug. The thin glass design makes this mug prone to cracking or shattering, despite being cool to look at. Be cautious when handling this fragile mug. In contrast to the mug, both the lid and infuser are quite sturdy and will likely survive a fall. The infuser is deep and allows plenty of space for your tea to properly brew. The infuser also fits conveniently in the lid once you are done steeping. This mug is elegant and a treat to look at. It will last a long time if you understand its fragile nature and treat it with care. It is a bit pricey at the time of writing, but overall this mug is not a bad choice if you want a beautiful glass infuser. Stainless steel with small holes. Food grade silicon band around base. This Venus Glass Cup Infuser by Tealyra is both beautiful and functional. The mug has a double-walled glass design which keeps your hands from burning if you touch the outside. It also keeps your drink hotter for longer by insulating the inside. 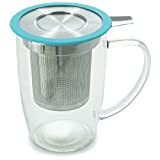 This tea infuser mug has a thick glass lid and a stainless steel infuser. This mug does have a number of downsides despite its beauty. First of all, it is very wide and won’t fit in most car cup holders. And second, the glass is thin and can break or crack easily. The infuser itself is deep enough to give your tea leaves room to expand and the holes around it are fine enough to keep all but the smallest tea particles in. There is also a silicone gasket around the base of the infuser that keeps the infuser secure and prevents it bumping against the glass body. The glass lid can act as a drip tray for the infuser once your tea is ready. This can prevent the infuser dripping and making a mess on your counter. The infuser, lid, and body are all dishwasher safe but are easy enough to hand wash as well. If you want a beautiful mug that can be used around the home, this Venus Glass Infuser Mug will not disappoint. The Tealyra Peak Ceramic Tea Cup Infuser consists of three parts. It has a standard ceramic body and handle as well as a ceramic lid. The third part is a stainless steel infuser with fine holes. The mug itself has a large capacity and can hold up to 16 ounces. It is also rather durable and heavy duty with a high heat capacity. This puts it a bit on the heavier side. The holes in the infuser are small enough that your tea won’t leak through very much. There is also a silicon gasket around the base of the infuser that will keep it from moving around while your tea is infusing. The lid can also act as a place to put the infuser once you are done infusing your tea. If you choose to use the lid after you remove the infuser, it will not form a snug fit and may jiggle around a bit. This tea infuser mug is easy to clean and makes a good every day mug. There are also several color options that allow you to personally customize your mug. This mug is a good choice if you want something that is durable and has a large capacity. This mug is super light, clean, and beautiful. The Emoi Glass Brewing Tea Cup is made of heat resistant Pyrex glass and has a glass handle. 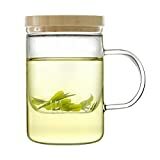 There are several varieties of this mug, but the one shown in the link has a bamboo lid and glass infuser. Each component is made of non-toxic materials that won’t leech into your coffee. Several customers have complained of an odor with the bamboo lid, but this is completely natural and will go away after several washes. What I love about glass mugs and with glass infusers is that you can actually watch the tea leaves expand and unfurl. It creates a much more intimate experience than a ceramic or metal mug with a metal infuser. The glass infuser has several slits on the bottom that allow water to pass through. These slits can get clogged with tea and they also let smaller leaves through. Even though glass is beautiful to watch, it can break easily. The glass on this mug is rather thin making it even more prone to cracking. Overall, this mug is an elegant and natural way to drink tea. Treat it with care and it will last a long time. With this mug, you get to choose between several cute and funny infuser characters. There is Fred the sloth, Narwhal, Mr. Tea, and Manatea. Get it? Mana-tea. Bad puns aside, each character comes with their own custom mug design. While the infuser isn’t the most functional in the world, it gets the job done. The infuser isn’t super easy to clean out either. This mug may not be a great every day tea infuser mug, but it makes a great gag gift for a friend that is into tea.